But this love didn’t start early. As a child, I loved writing, but reading really wasn’t my thing. Recently, I had an epiphany. When I was a child, I was pushed fiction books to read all the time. That’s about all we were given (other than textbooks, obviously) as kids in school. There were never books about various interests, just “stories.” And while I enjoy reading the odd fiction book now, my preferred genre is non-fiction. Whether it’s business, self-development, or my favourite, memoirs of those with interesting stories to tell, I love learning through reading. Perhaps I didn’t enjoy reading as a child because I was never given the choice of what to read. That has all changed now, of course, and my love of reading, combined with my love of acting, has created a great opportunity to read to my children and use all the different voices and accents I can make up. This means I’ve been reading more children’s literature, as well as more fiction. Our family enjoys both fiction and nonfiction, and of all the things we left behind before we came on this trip, the most difficult to put into storage were our books. We did bring some books on the trip, however, as well as eReaders and a tablet for ease of book carrying. While some would argue that listening to an audiobook isn’t “reading,” to me, it doesn’t matter. Yes, of course you should read print whenever possible, but just like tablets in education, there’s a time and a place for listening to audibooks. For example, for children who don’t yet read, listening to audibooks (or a parent reading) helps them to develop a love for literature early on, and I would argue, even an interest in learning to read. For children who need to be in constant motion, audiobooks provide an opportunity to enjoy literature while still allowing for energy expenditure. And for those who are on the road, like us, audiobooks means being able to carry as many books as we like, and still have a chance to discover new and re-discover old literature. On this trip so far, we’ve had lots of time to do reading, whether that be on our own, through audiobooks, or with me reading to the family while my husband drives. But what if you’re not on a road trip, and you simply don’t have the time to read? Make the time. Reading is such an amazing activity, and has a tonne of benefits. It expands your knowledge, relaxes you, and builds your vocabulary, among other benefits. But in today’s rushed world, it’s hard to find the time to enjoy these benefits. Here are some simple ways to enjoy reading, even when you’re short on time. Even 5 minutes of reading a day will relax you and allow you to take a break from your busy life. Set aside 5 minutes of your lunch break or 5 minutes after a meal to read a page or two. Stop scrolling through social media during your commute or when you’re bored, and replace that time with reading time. You can even use your phone for reading time if needed. If carrying a book is burdensome, use an eReader or even an eReader app on your phone. 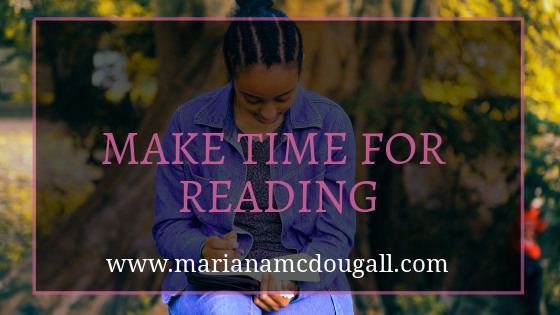 Reading is reading; use the tools available to you to read in the most convenient and efficient way for you. Although multitasking has earned a bad rep in recent years, when it comes to reading, it might be worth a try. If you’re already fitting exercise into your day, why not add reading to you exercise? Here’s where audiobooks work wonderfully. Listen to a book as you run, cycle, or lift weights. I didn’t like reading as a kid because people constantly told me what to read. Now that I’m an adult, I pick books that interest me, and I enjoy reading so much. If you pick books you enjoy rather than the ones you think you “should read,” you’ll be much more successful in your quest for more reading time. How do you fit reading into your day?